The sun’s been shining the last couple of days and everyone’s asking for lightweight yarns for spring and summer projects. We have loads of options! 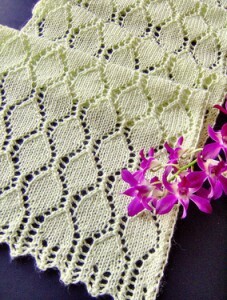 A lovely lacy scarf that’s simple to knit, perfect for a novice lace knitter. Start knitting now and you’ll be wearing it all summer long. There are several fantastic BSA patterns for Alpaca Silk, including the ever popular Rectangle Shawl, the cute Silk Shrug and the recently released Sunday Cardigan. If you haven’t yet seen this yarn you should really drop by and give it the touch test. It’s stunning. Of course cotton is a popular choice this time of year and BSA Skinny Cotton is one of our faves. The Purl Dot Cardi is a cute new release. Or try the Girls Skinny Tank , a free pattern over at Blue Sky. Our special this week is Rowan Classic Luxury Cotton DK at 40% off. Another ideal yarn for light weight spring and summer projects. It’s a classic DK weight so there are endless pattern options. And of course we have many more lightweight yarns for spring and summer knits. We’re always happy to help you find the perfect yarn and design. Just pick up the phone, send an email or better yet, drop by for a visit and we’ll help you find the perfect new project. This entry was posted on Wednesday, April 8th, 2009 at 12:05 pm	and is filed under Uncategorized. You can follow any responses to this entry through the RSS 2.0 feed. Both comments and pings are currently closed.